Next time you drive to Lake Pleasant on highway 74, please look left and right and admire the clean roadside between mile marker 25 and the Lake Pleasant Parkway intersection. 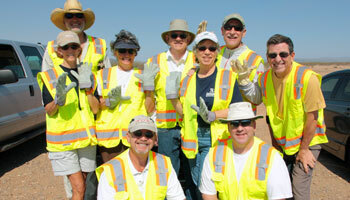 Soon you’ll see a sign there that says the area was cleaned by your Arizona Yacht Club. 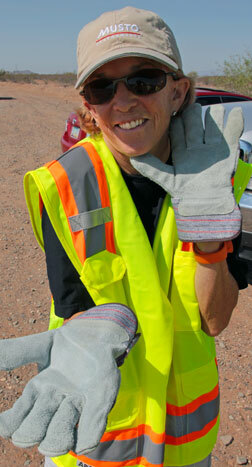 Ten of us put on glaring yellow-green vests and gloves to do it on Saturday morning (5/19). I didn’t like people who litter even before spending 2½ hours cleaning up after them. Now? Is capital punishment too strong? Peter Lehrach organized this work party, coordinating with the oh-so-strict rules of the Arizona Department of Transportation and providing the vests (thank you Cox), the gloves, the poker sticks, and the hydration. At the post-clean-up lunch at Wild Horse West, we voted the two marijuana pipes the most interesting find of the day. Plastic bottles and tire fragments were the most common, followed closely by beer cans and bottles and cigarette packs. Now here’s the good news: to keep that sign announcing that AYC keeps that road clean, we get to do this three times a year and next time you can help. Next time it’ll be cooler. And next time it should go faster because the area shouldn’t be quite so big a mess and because of Things We Learned. Some “Things”: this isn’t your front lawn so don’t worry about picking up every small scrap. If we go for the major items, we can move at almost ambling speed. Peter says ADOT estimated it should have taken us an hour to cover the distance; it took us several times that long and we didn’t make it all the way to the end before giving up and heading in for a beer. Maryellen Ferring's chic clean-up outfit: Keith Musto would be proud.